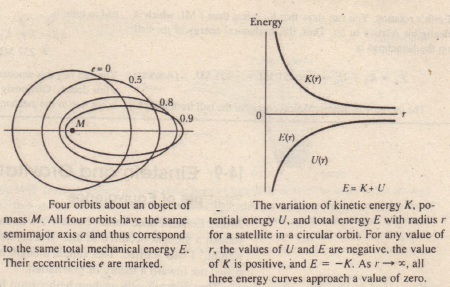 As a satellite orbits Earth on its elliptical path, both its speed, which fixes its kinetic energy K, and its distance from the center of Earth, which fixes its gravitational potential energy U, fluctuate with fixed periods. However. the mechanical energy E of the satellite remains constant. 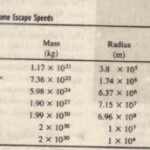 (Since the satellite’s mass is so much smaller than Earth’s mass. Tells us that the total energy of an orbiting satellite depends only on the semi major axis of its orbit and not on its eccentricity e. For example, four orbits with the same semi major axis are shown in the same satellite. 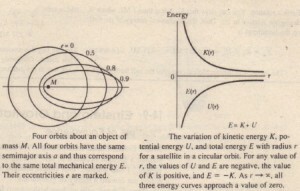 would have the same total mechanical energy E in all four orbits.Shows the variation of K, U, and With r for a satellite moving in a circular orbit about a massive central body. orbits shown in the figure will the shuttle then take? 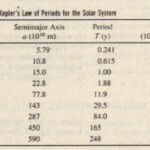 (b) Is the orbital period T of the shuttle (the time to return to P) then greater than. less than, or the same as in the circular orbit?